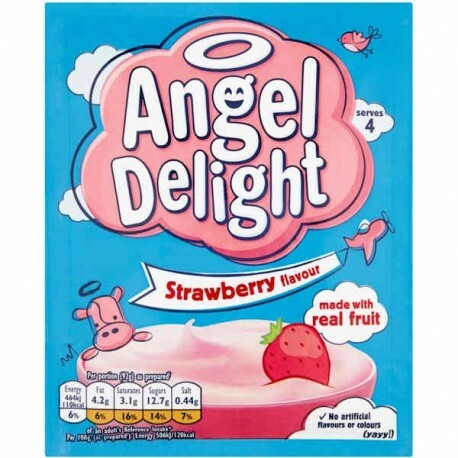 Angel Delight whipped dessert remains a firm family favourite, with little angels in particular loving its light, milky taste. 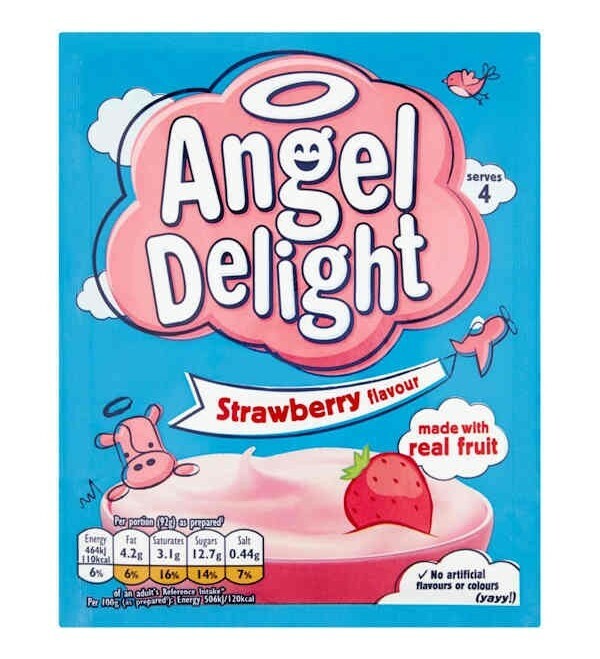 Angel Delight whipped dessert remains a firm family favourite, with little angels in particular loving its light, milky taste. This tasty and convenient powdered pudding is quick and easy to make – just add milk and whip! It’s a great source of calcium and contains no artificial colours, flavours, preservatives or hydrogenated fat with the same great taste you have grown up with. Makes 4 servings. Ingredients - Sugar, Palm Oil, Modified Starch, Emulsifiers (Propylene Glycol Esters of Fatty Acids, Lecithins), Gelling Agents (Sodium Phosphates, Diphosphates), Lactose (Milk), Milk Proteins, Strawberry Powder (2%), Whey Powder (Milk), Calcium Carbonate, Anti-Caking Agent (Silicon Dioxide), Colours (Beetroot Red, Carotenes), Flavouring. Ingrédients - Sucre, huile de palme, amidon modifié, émulsifiants (Esters de propylène glycol des acides gras, lécithines), Gélifiants (phosphates de sodium, diphosphates), lactose (lait), protéines du lait, poudre de fraise (2%), poudre de lactosérum (lait ), Carbonate de calcium, anti-agglomérant (dioxyde de silicium), couleurs (betterave rouge, carotènes), arômes.